Foxes are natural born hunters that like rabbits, rodents and birds for lunch. Their diet is flexible, however, as they also eat vegetables and fruits and will forage in garbage. Sometimes they stash food, burying it under the cover of leaves, snow or soil to eat later. A male fox, a reynard and a female, a vixen, usually mate during the winter and give birth to about five or more pups, born between March and May. They are stealth animals and can run somewhere between 30 and 40 mph. Typically, they can escape danger, provided it is not man-made, and live as long as 14 years. The English often say that the Greeks and Romans used dogs to track prey for hundreds of years. The tradition to train scent hounds to track and kill may have originated with a farmer’s attempt to use farm dogs to catch foxes back in 1534. Farmers consider them vermin and this pest control has a bonus: highly prized fur. The practice of sport riding actually started with deer (called “stalking") until hunters decimated the UK deer population in the eighteenth century. Game was legally defined as hare, partridge, pheasant and some other birds. In 1671, laws restricted the right to hunt game. People had to have a freehold of at least £1000 a year or a leasehold of at least £150—in other words, the rich aristocracy and the nobility. That was the law until 1831. No one else could hunt, but poaching became rife. It was illegal and had big offenses, such as banishment to Australia for seven to fourteen years or hard labor in England. In the mid-1700s, a resident of North Leicestershire named Hugo Meynell began breeding dogs at Quorn Hall. The goal was to make them as fast as the foxes. With that success, suddenly everyone was off and running. They come to the estate for weekend. The leaders—the master, huntsman and whippers-in—dressed in pink coats known as “pinques," with their hunt’s colors on their collars and brass buttons. Nestled under this is a white cravat and on top, black velvet hats. Prestigious guests don black, gray or navy fitted frock coats, tan riding pants with knee patches and top hats (women wear black velvet caps, if they so choose). They mount horses, black boots etched with patent leather trim in stirrups, crops (whips) in hand, o civilized, so upper class. Other followers wear black coats with top hats or bowlers. More helpers, including grooms with relief horses and “stoppers" who close up the fox dens, make up the entourage. In the early morning, the stopper covers up the holes of the fox dens to prevent the nocturnal animals from returning. About 11 a.m., the master issues a command and the 40 or 50 yapping hounds sniff out the covert (pronounced “cover")—a field or patch of woodland—where foxes nest and seek refuge. When a fox is found, the dogs bleat their delight, and flush them out. A horn is sounded and the master shouts, “Tally-ho!" and the hunt begins. They gallop across country at top speed, splash through rivers and dash across fields. When a fox is spied, a high-pitched “Holla" follows. If a kill is made, the bushy tail, head (mask) and pads (feet) are presented as trophies to whomever the master determines. Then the body of the fox is thrown to the hounds to devour. A child riding in his first hunt might be “blooded" by being smeared with the blood of the dead fox kill. The season typically began the first Monday in November, although, September was special for “cub hunting"—a sort of training for inexperienced riders. The event was thought of as manly, patriotic and good fun. Anti-hunting campaigns sprung up and the debate began: was the sport sporting or cruel? Of course, the fox was chased to exhaustion and the hounds do what they wish upon catch until there is nothing left but tail. The Burns Inquiry began in December 1999, named after the retired civil servant Lord Burns. One result was that hunting with dogs seriously compromised the welfare of foxes. It was not decided categorically whether hunting should be permanently banned in the United Kingdom. An options bill went to each House of Parliament and the House of Commons voted to ban the sport while the House of Lords voted for self-regulation. Of course, being the sport of men of Parliament historically, the debate was heated and passionate. Finally, in November 2004 the Hunting Act passed, banning it in England and Wales. 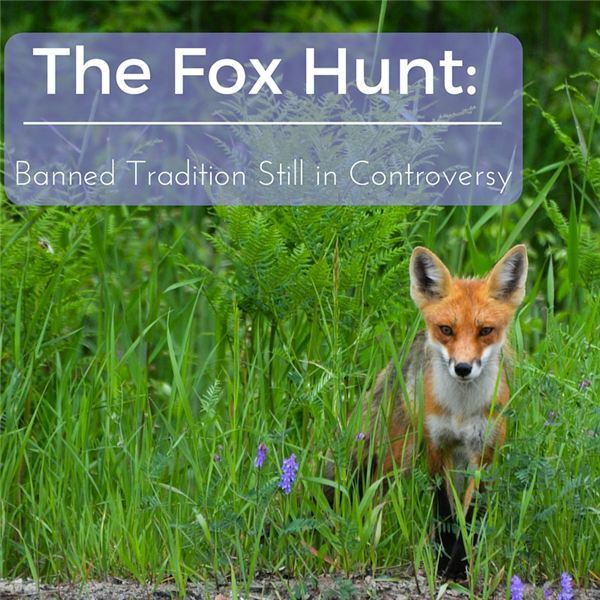 While the use of dogs was prohibited, following fox with hounds was not, as long as the fox was not killed by the dogs’ claws and gnashing teeth, but was shot by a gun instead. Of course, mistakes will happen. It’s hard to retrain dogs. A group known as Countryside Alliance (pro-hunting) claimed that more foxes were killed post-ban than when hunting was legal. An equestrian sport has grown involving dragging an object over the ground and laying a scent for the hounds. It takes in a larger area and riders often have to change horses mid-hunt. The traditional-style hunt continues in Australia, Canada, France, Russia and India where the sport sees frequent membership increases. People who can afford heavy fees, expensive horses and guns ignore the ban routinely and still flaunt breaking the law with all the pomp and ceremony continuing. As a result, there were over 300 successful prosecutions in the past 10 years but the punishments are lenient in comparison to other forms of animal cruelty. Activists with phones who try to video these events often are prosecuted on behalf of the hunters. Police may or may not take action. What do you think? Where do your sentiments lie? Thomas, Isabel. Fox: City Safari. Chicago: Heinemann Library Capstone Global Library LLC, 2014. Book. Pool, Daniel. What Jane Austen Ate and Charles Dickens Knew: From Fox Hunting to Whist—the Facts of Daily Life in 19th Century England. New York: Heinemann Library, 2014. Book.